Aquaria AQ BETTA BOWL STARTER KIT - Rick's Pet Stores Inc. The Aqueon Betta Bowl is the perfect beginner aquarium for children and parents alike! This 0.5 gallon starter kit is easy to setup and maintain. It includes everything you need to get started (just add fish and water! ), and its compact size makes it ideal for placement anywhere in your home or office. The Betta Bowl features an easy-open feeding door which allows you to feed your pet Betta without removing the entire lid. 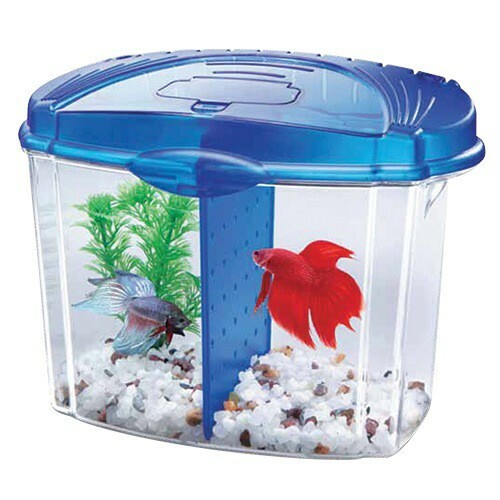 The versatile Betta Bowl also gives you the option to house 2 Bettas in one aquarium. 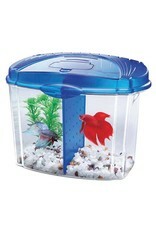 Just slide in the included divider, and watch your little friends extend their fins and flaunt their spectacular colors! The Aqueon Betta Bowl Aquarium Kit includes: 0.5 gallon aquarium and lid with feeding door, Aqueon Betta Food and Betta Bowl Plus Samples, Betta divider, decorative plant, and gravel.8.75" x 5.25" x 7"